1. For the use of the magnifying face, it is advisable to stand at a distance 10-15 cm from the mirror, otherwise the reflection of the face will be blurred and inverted. 2. Please do not hang heavy stuff on the swivel arm to avoid damage. 1. Please refer to the measurement. Tiny measuring error is allowable in normal range. 2. There might be a little color difference due to the monitor, camera or other factors, please refer to the physical item. 【Material】: Brass/ Stainless steel. 【Size】: 6 inches/ 8 inches (As shown in the picture). 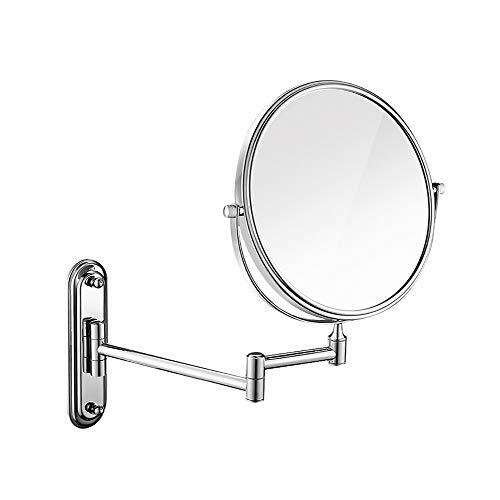 【Double sided vanity mirror】: With a normal side and a 3X magnifying side, the wall-mounted bathroom magnifying mirror is ideal for shaving, contact lens setting, make-up, hair removal and other hygiene activities. 【Rotatable Design】: 360° swivel design double sided circle mirror has a diameter of 8 inch and has a smooth brandy glasses design, 360° to be fixed at any angle you like. 【Multi-purpose】: Best for use in home bathroom, luxury hotel and spa, attractive and elegant design with high quality make by copper frame and silver plated glass. If you have any questions about this product by Wall-mounted Folding Mirror, contact us by completing and submitting the form below. If you are looking for a specif part number, please include it with your message. CTBU Glass Less Mirror Physical Activity Panel 16" X 48"